Collora Piano was founded and is run by piano technicians, and we are committed to technical excellence. We are passionate about piano music, and our mission is to give something back to musicians and piano lovers all over the United States by providing the highest caliber, most technically perfect pianos at the lowest possible price. Our technical services are available in private homes, churches, institutions, and concert halls. Every new piano is tuned many times before it leaves our showroom floor, which greatly enhances the piano’s stability. Other dealerships simply don’t prepare their pianos at this level. While they may offer one free tuning after delivery, you may be left with the cost of the other prep work new pianos require to reach peak performance level. When you take home a Collora piano, you save thousands in tuning and prep work for which you might otherwise have to pay. The key to Collora’s excellence, apart from our commitment to providing high caliber instruments for the lowest possible prices, is the expertise of our service department. Our service department is composed of long-time piano technicians who are knowledgeable in every area of piano service, from basic tuning to large scale soundboard replacements and total restorations. 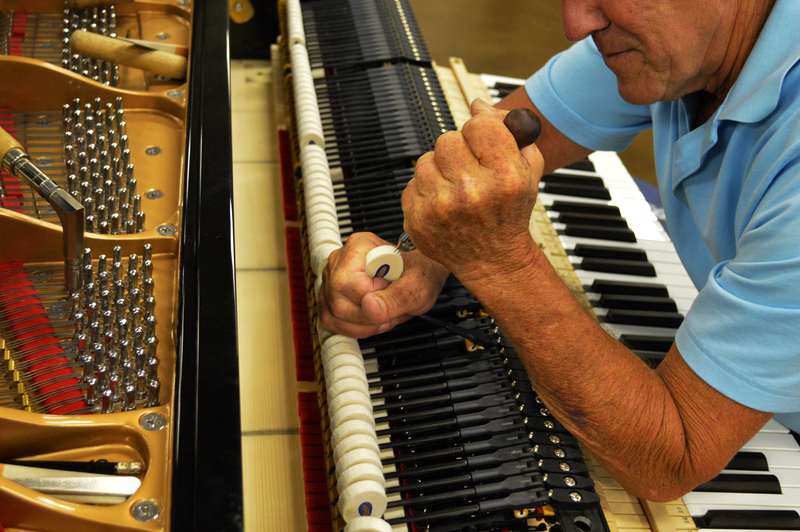 No matter what your technical concern, Collora Piano technicians are qualified to address it. The staff shares decades of combined experience and expertise and is able to answer virtually any question or address any concern. Their highly attuned ears can detect and correct even the most miniscule tonal differences across string breaks. Action weights can be adjusted to play heavier or lighter, as desired, and any piano can be voiced to suit your taste.